Tarantula Distribution emancipate from Tarantula’s production movies and buy 3 new films for the distribution in Luxembourg or Benelux in 2016. – Tête Baissée by Kamen Kalev with Melvil Poupaud. – My Skinny Sister by Sanna Lenken, Berlinale last Cristal Bear and Public Award. 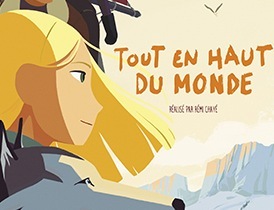 – Long Way North by Rémi Chayé, Public Award in Annecy International Animation Film Festival.